A cold front will roll into the region later Thursday with a few showers. The end of the week and early part of the weekend will be much cooler. A record high temperatures was set at Metro Airport in Baton Rouge on Wednesday. 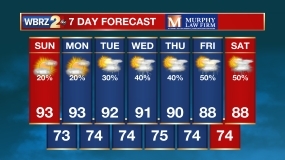 82 degrees eclipsed the previous mark of 81 degrees set in 1957. Thursday's record of 82 degrees was made in 2017. Today and Tonight: Thursday's high temperatures will reach the upper 70s and low 80s beneath mostly cloudy skies. A cold front will push into the area during the afternoon and evening with a bout of rain and possibly an embedded thunderstorm. Most locations should receive rain, but it will be short-lived and light. 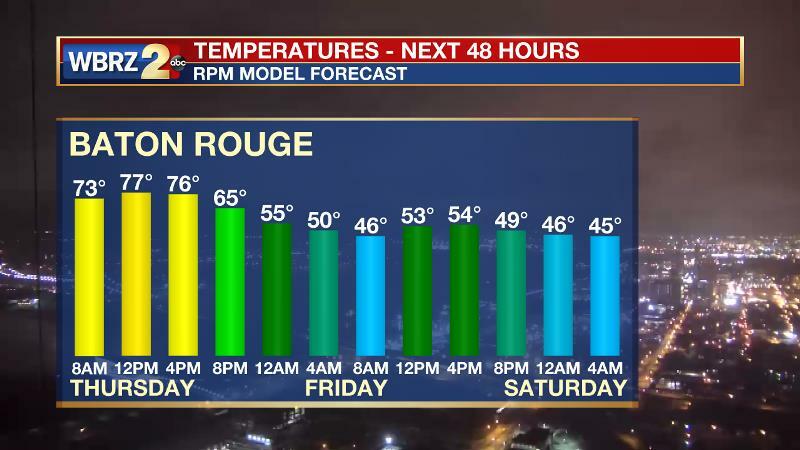 The estimated timeline is 4pm -10pm from northwest to southeast across the WBRZ Weather forecast area. Activity is anticipated in the Baton Rouge area around 6pm. This front will result in quickly falling temperatures overnight as winds shift northerly. By morning, most of the showers should be wrapped up with thermometers in the low 50s and upper 40s. Up Next: Below average temperatures will be restored through Saturday. However, the cold front will not flush away all low level moisture and some clouds will stick around. It looks as though this cool stretch will be short, possibly only lasting a day or two before mild air returns. A warm front will lift through Sunday night and put showers back into play for Monday and Tuesday. After any fog and low clouds dissipate, expect temps to climb back into the upper 70s to lower 80s. This will bring a chance for a second straight high. The previous mark of 82 was set just last two years ago. A broad trough will move across the country Thursday and Friday, sending a cold front through the local area. The basin of the trough will remain well north of the region along with the prime ingredients for severe weather. A band of rain and embedded thunderstorms will move through Thursday afternoon and evening, likely ending by midnight. Expect rapidly falling temperatures behind this activity. Highs and lows will tumble by a good 20 degrees for Friday and Saturday. The cold front is expected to stall in the central Gulf and retreat north as warm front by the second half of the weekend. This will return milder air, clouds and showers for Sunday into Monday.